Pembina Pipeline Corporation (TSX: PPL; NYSE: PBA) announced that it has entered into agreements to expand the Vantage pipeline system for an estimated capital cost of $85 million. The Vantage Expansion entails increasing Vantage’s mainline capacity from 40,000 barrels per day (“bpd”) to approximately 68,000 bpd through the addition of mainline pump stations and the construction of a new 80 kilometre, eight-inch gathering lateral. The Vantage mainline expansion is supported by a long-term, fee-for-service agreement, with a substantial take-or-pay component, and the gathering lateral is underpinned by a fixed return on invested capital agreement. Subject to regulatory and environmental approvals, the Vantage Expansion is expected to be in-service in early 2016. Once the Vantage Expansion is in-service, Pembina expects that the overall system, including base capacity, expansion capacity and volumes from the company’s Saskatchewan ethane extraction plant will result in an EBITDA range of $75 million to $110 million per year, with the base of the range representing consolidated take-or-pay volumes. 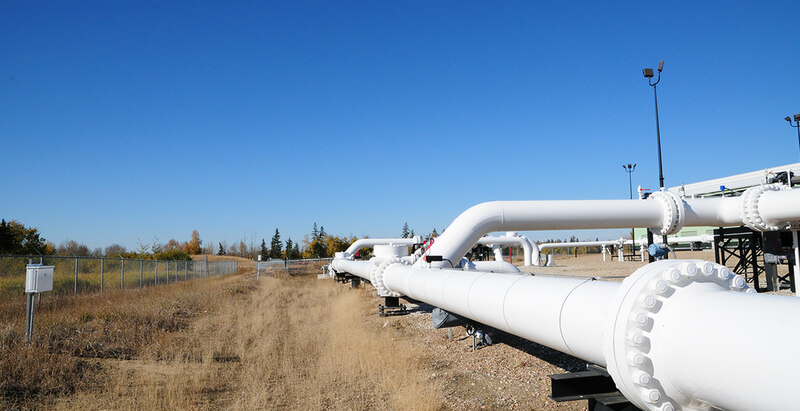 Vantage is a recently constructed, approximately 700 km high vapour pressure pipeline that links a growing supply of ethane from the prolific North Dakota Bakken play to the petrochemical market in Alberta. It originates from a large-scale gas plant in Tioga, North Dakota extending northwest, through Saskatchewan and terminating near Empress, Alberta, where it is connected to the Alberta Ethane Gathering System pipeline. Calgary-based Pembina Pipeline Corporation is a leading transportation and midstream service provider that has been serving North America’s energy industry for 60 years. Pembina owns and operates pipelines that transport various hydrocarbon liquids including conventional and synthetic crude oil, heavy oil and oil sands products, condensate (diluent) and natural gas liquids produced in western Canada. The company also owns and operates gas gathering and processing facilities and an oil and natural gas liquids infrastructure and logistics business. With facilities strategically located in western Canada and in natural gas liquids markets in eastern Canada and the U.S., Pembina also offers a full spectrum of midstream and marketing services that spans across its operations. Pembina’s integrated assets and commercial operations enable it to offer services needed by the energy sector along the hydrocarbon value chain. All financial figures are in Canadian dollars, using a CND/US dollar exchange rate of 0.8275.